Let’s take a look at a few new window features in macOS Sierra. Although Sierra windows are similar to windows you’ve used in other versions of Mac OS, you may just discover a new wrinkle or two in how you move and shuffle them. To move a window, click anywhere in a window’s gray title bar or toolbar (except on a button, menu, or search field) and drag the window to wherever you want it. The window moves wherever you move the mouse, stopping dead in its tracks when you release the mouse button. If you can’t find the cursor on the screen, wiggle your finger on the trackpad or jiggle the mouse. In Sierra, these movements magnify the pointer to make it easier to find onscreen. The commands on the Window menu provide tools you can use to manage your windows. Minimize (⌘+M): Use this command to minimize the active Finder window to the Dock and unclutter your Desktop. It’s the same as clicking the yellow gumdrop button. Zoom: This command does the same thing as the green gumdrop button. If you’ve forgotten what the green gumdrop does already, just turn back a few pages to the “Top o’ the window to ya!” section and read it again. Cycle through Windows (⌘+`): Each time you choose this command or use the keyboard shortcut for it, a different window becomes active. So if you have three windows — call’em Window 1, Window 2, and Window 3 — and you’re using Window 1, this command deactivates Window 1 and activates Window 2. If you choose it again, the command deactivates Window 2 and activates Window 3. Choose it one more time, and it deactivates Window 3 and reactivates Window 1. The next four commands in the Window menu help you manage Sierra Finder window tabs (which were introduced in OS X 10.9 Mavericks). If you’re a fan of tabbed browsing (à la Safari), you’ll love tabs in a Finder window. 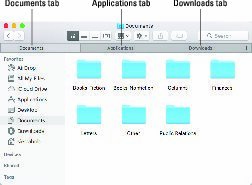 You can view the contents of your Downloads, Applications, or Documents folders by merely clicking the appropriate tab. Tabbed windows are an ingenious way to cram a lot of information into a little space. Sierra introduces system-wide tabbed windows, which should work in almost every application that uses windows. The cool part is the app doesn’t have to be updated in any way — Sierra grafts tabbed windows onto almost every app that displays multiple windows. This application — GraphicConverter9 — is a couple years old but it still gets Sierra’s new systemwide tabbed windows. Show Previous Tab (Control+Shift+Tab): Each time you choose this command or use the keyboard shortcut for it, the previous tab — the one to its left, unless it’s the leftmost tab — becomes active. Use this command, and Applications becomes the active tab. Use it a third time, and Downloads becomes active. Because Downloads is the leftmost tab, if you use this command yet again, it wraps around and Documents becomes the active tab again. Move Tab to New Window (no keyboard shortcut): Does just what it says: Moves the active tab into a new window of its own. Merge All Windows (no keyboard shortcut): Combines all open windows and tabs in one window. One more thing: In Sierra, all these commands and keyboard shortcuts appear in most apps that display windows. Bring All to Front (no keyboard shortcut): Windows from different applications can interleave. For example, you can have (from front to back) a Finder window, a Microsoft Word window, an Adobe Photoshop window, another Microsoft Word window, and another Finder window. 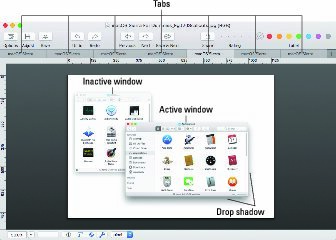 In this example, choosing Bring All to Front while the Finder is the active application enables you to have both of the Finder windows move in front of those belonging to Word and Photoshop. Other items: The remaining items on the Window menu — if any — are the names of all currently open Finder windows. Click a window’s name to bring it to the front.